Cycling legend Levi Leipheimer crosses the line for his second first-place finish in three years. 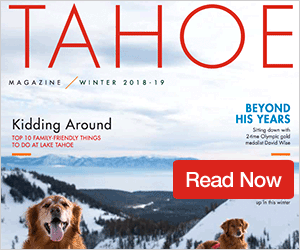 Since 2011 the CenturyLink Tahoe Trail MTB has been one of the area’s premier mountain bike races, attracting some of the top riders in the sport in a bid to qualify for the Leadville Trail 100 MTB later in the year. One of America’s top road cyclists, Levi Leipheimer, captured first place in the 100-kilometer distance, outpacing the field on the ski area trails, mountain roads, and single track near Northstar California Resort to finish with a time of 3 hours, 58 minutes, 13 seconds. “There are only a few events I consider to be ‘must do’ and the Tahoe Trail 100 at beautiful (Northstar California Resort) is one of them,” posted Leipheimer to his social media pages before the race. Leipheimer’s win makes it three straight years elite road cyclists have taken the overall victory. Peter Stetina (4:05:23) won last year’s race, and Leipheimer (3:59:58) won the year before. Jamey Yanik, of Boise, Idaho, finished runner-up for the second straight year with a time of 3:58:50. Former Brazilian road cyclist Stefano Barberi was third with a time of 4:14:51. Truckee’s Troy Deibert was the top local, finishing with a time of 4:37:57 for 13th overall and second in the men’s 40-49 division. No woman came close to catching Truckee’s Julie Young, who outpaced the nearest competitor by more than 24 minutes to capture this year’s women’s title with a time of 5:10:06. Young, who won the race in 2011 and was third last year, returned to the top of the podium for the second time in her eight years of competing, and said moving to a single-speed bike was the difference in capturing the win this year. Dana Kuper, of San Francisco, was second with a time of 5:34:23. Truckee’s Sian Crespo was third with a time of 5:41:03. This year’s course featured a few alterations from years past, as more than 300 riders set off Saturday morning to compete in the 100-kilometer distance. The race served as a qualifier for the Leadville Trail 100 on Aug. 11. Those who qualified previously or picked up a lottery entry, donated their qualifying coins to other riders in the crowd, resulting in tears of joy from many of the participants. 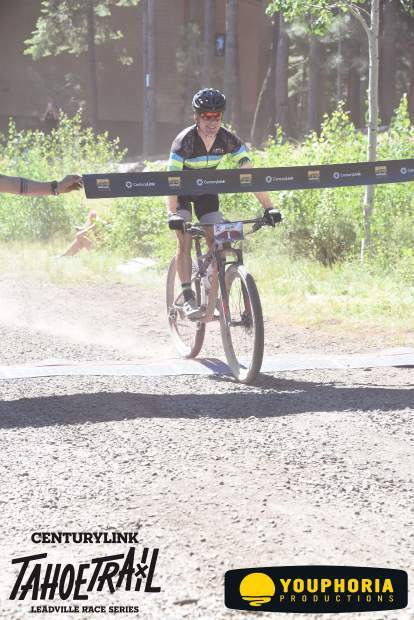 Cyclists can still qualify for Leadville at either the Leadville Stage Rae on July 27-29 in Colorado or at the Barn Burner in Flagstaff, Ariz., on Sept. 8. 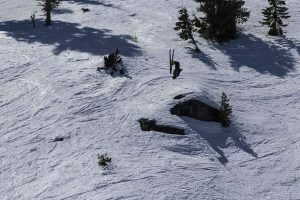 The day’s events also featured a 50-kilometer distance, which was won on the women’s side by Truckee’s Samantha Shields, giving local women a sweep of the 50- and 100-kilometer races. 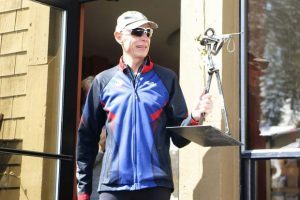 Shields time of 2:44:13 was good enough for 15th overall and was more than 12 minutes faster than second place, Truckee’s Debbie Hakansson (2:56:40), whose time was good enough for first place out of the 60-69-year-old division. Krista Strecker, of Truckee, gave local women three athletes in the top four, with a time of 3:01:55. Truckee’s Annie Rutledge (3:09:33), and Annie Rosenfeld (3:15:10) also cracked the top 10. On the men’s side, Justin Pfaffinger, of Grass Valley, captured the overall win with a time of 2:22:50. For full results visit TahoeTrailMTB.com.